MBM-91. 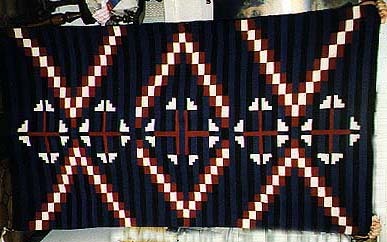 Superb weaving of eight Yei-Be-Chei dancers from the great Dine' ceremonial Night Chant, by Pauline Bigman of the Tonalea area, 48 in. x 30 in., with weaver's pathway. 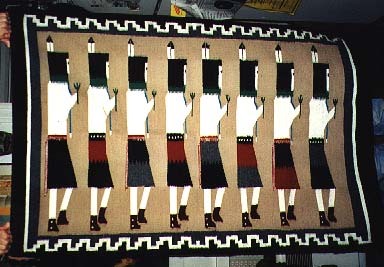 The dancers wear encircling cedar neck ruffs and turquoise necklaces, and hold cedar branches. Wonderful meandering step border; commercial and handspun wool. 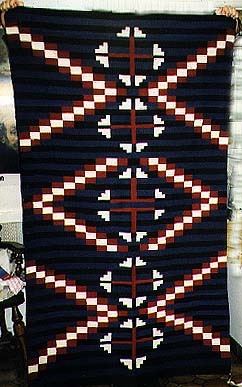 The rhythm of the dance is caught eloquently in the upraised stepping feet, each dancer wearing traditional Dine' (Navajo) rust-colored mocassins with silver (white) buttons; and in the pattern of alternating red and white ceremonial woven sash belts and concho belts. SOLD. or email to: carol@migrations.com to place an order, or for more information. Copyright © 1998-2001 Carol Snyder Halberstadt, Migrations. All rights reserved. Return to Migrations home page.